Ebury Brass is an ensemble made up of some of the top British Corps of Army musicians. It is formed from the five famous Foot Guards' Bands in London. The ensemble has worked with Grimethorpe principal cornet Dr Roger Webster on his CD 'My Heroes' and it is rehearsing arrangements from the Superbrass ensemble led by bass trombone virtuoso Roger Argente of the Royal Philharmonic Orchestra. Ebury Brass encourages professional brass musicians to join the Corps of Army Music as they play for the military and the public in recitals and other settings. They can be heard in the historic Guards Chapel on Birdcage Walk off St James’ Park in London on Tuesday 27th October 2015 at 1.00pm. During the recital the ensemble will raise money for the charity 'Children of Fire', www.firechildren.org. 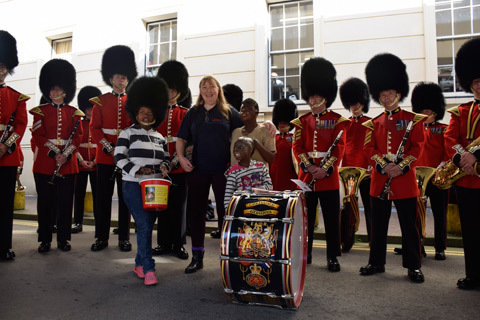 The recital forms part of a Household Division Open Day to highlight career opportunities for musicians within the Army. The closest tube stations are St James’ Park, Westminster or Green Park. Don’t be late! Four trumpets, three trombones, a French horn, one euphonium and one tuba along with percussion will include players from the Grenadier Guards, the Irish Guards, the Coldstream Guards and more.